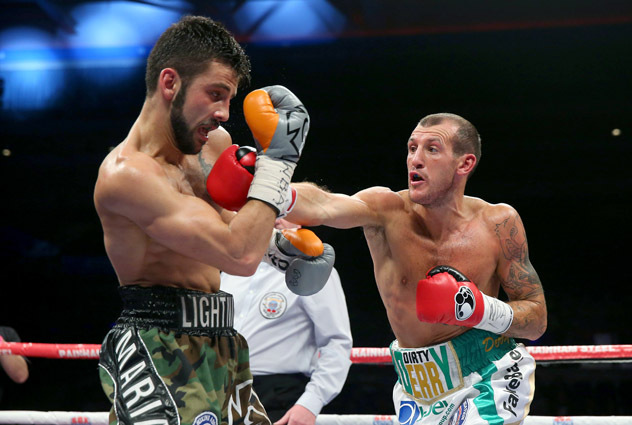 Following a nightmarish wrap up to his preparations, tenacious British lightweight Derry Mathews won a hard fought 12-round unanimous decision over late replacement Tony Luis in Liverpool, England, on Saturday. The official scores were 114-112 twice and 115-112. Mathews (38-9-2, 20 knockouts) had been scheduled to face Richar Abril, for the WBA lightweight title, only to be let down for a second time when the Cuban’s health prevented him from competing. A big-punching replacement, Ismael Barroso, then encountered visa problems before Luis, from Ontario, Canada, agreed to cross the Atlantic on just 4 days’ notice. Luis, unquestionably in fighting shape at 134 pounds, had been scheduled to appear on a card in Minnesota and it must be said that neither man allowed the musical chairs scenario to hinder their respective performances. The Canadian pressure fighter pursued Mathews for the duration of the contest and, despite being picked off by nifty counters on the way in, more than held his own in a fight that could have gone either way. Cheered on soccer style by a raucous home support, the 31-year-old Mathews landed scores of crisp hard punches from the outside, although nothing could dissuade Luis from marching forwards. The visitor frequently tagged the taller man with jolting power shots of his own and forced his opponent to work hard in each session. Both men were deducted a point a piece in Round 8, Mathews for a low blow and Luis for intentional use of the head, but it was spirited two-way action down the stretch. Luis appeared to win the final round easily but it wasn’t enough to secure a win away from home. If you’re interested, here is the current situation with the WBA. According to the governing bodies own rules and regulations: Richar Abril is now a champion in recess, Colombian Darleys Perez is full champion and Derry Mathews takes home an interim belt with his win over Luis. What happens now is anyone’s guess. * Note: As of this moment, THE RING still recognizes Richar Abril as WBA champion at 135 pounds. Unbeaten junior middleweight Liam Smith dropped Argentinine trial horse David Ezequiel Romero four times on route to a convincing seventh round stoppage on the undercard. The 26-year-old, who also hails from Liverpool, England, unloaded at will and worked the body and head effortlessly throughout. 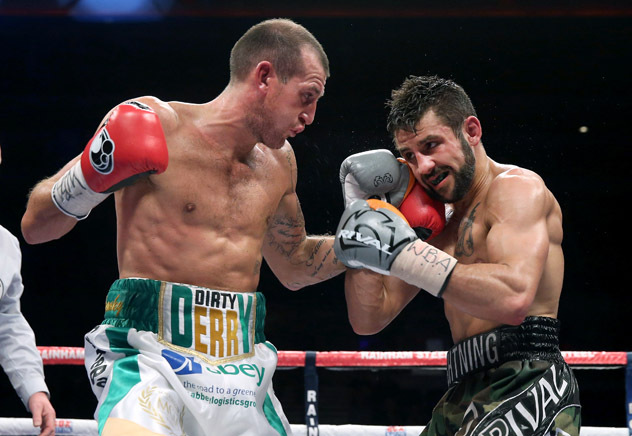 Smith, the reigning British champion, is required to make one more title defense in order to take ownership of the illustrious Lonsdale belt, although a European title tilt in the summer is another option. Highly ranked with the IBF and the WBO, Smith’s name has also been linked to both Cornelius Bundrage and Demetrius Andrade who hold world titles with those organizations respectively.